*Reset between reps. Start at a moderate weight and build to something heavy. *Partners must run 800m together. 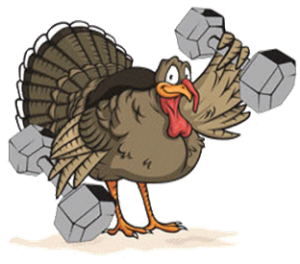 Don’t be a turkey, come on in to Capital City CrossFit at 7:00am or 8:00am to burn some calories before getting stuffed! Double Unders: These can split up between partners however they wish, but only one person working at at time. Score = total number of 500m intervals completed. Build to heavy with no misses. *At the top of every minute (including the first minute) each partner must stop what they are doing and complete 4 burpees. Only one person working at a time. Score is rounds + reps completed.